A large collection of E-ELT images and videos is available in the ESO Public Archive. Note that the above links will take you out of the Science User domain of the ESO web! 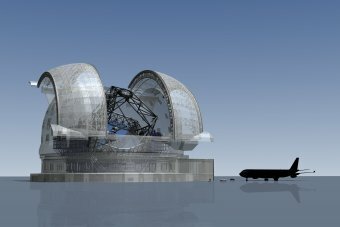 There are a number of ongoing or completed design studies for telescopes with diameters upwards of 20 metres. The FP7 E-ELT Preparation Programme (password protected) complements the final design phase of the E-ELT in several ways, including the implementation of a detailed Design Reference Mission. It is funded by the European Commission and conducted by ESO and 25 research institutes in its member states. OPTICON is an Integrated Infrastructure Initiative funded by the European Commission as part of its Sixth Framework Programme. OPTICON brings together providers and users of European astronomical infrastructures to identify common approaches and improve access for the benefit of all European astronomy. ASTRONET was created by a group of European funding agencies in order to establish a comprehensive long-term planning for the development of European astronomy. The mission of the European Strategy Forum on Research Infrastructures (ESFRI) is to support a coherent and strategy-led approach to policy-making on research infrastructures in Europe, and to facilitate multilateral initiatives leading to the better use and development of research infrastructures, at EU and international level.